What constraints must Seoul overcome to be an effective middle power? Ruling (Saenuri) Party Chairman Kim Moo-Sung led a South Korean National Assembly delegation visit to Washington this week and gave a speech at the Woodrow Wilson Center for International Scholars. 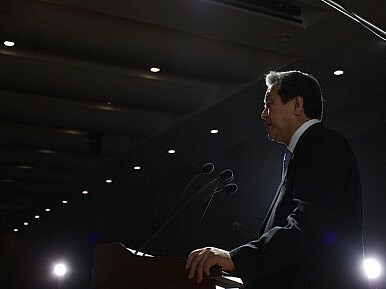 His speech included three points that nicely summarize the constraints South Korea is currently facing in its foreign policy. Chairman Kim called for “creative solutions that go beyond strategic patience” in U.S. policy toward North Korea, referencing the Iran deal and normalization of relations with Cuba. This reflects a continuing insistence from South Korea for the United States to recognize the North Korea issue as a pressing global challenge to the global nuclear regime rather than a regional issue. South Korea may try to engage North Korea on the nuclear issue, but North Korea has continuously regarded it as an issue for discussion with the United States. This is a point of difference that could become a sticking point in the alliance if it is allowed to fester. Some South Koreans are growing increasingly frustrated with a policy of defeatism without conceding defeat; there is growing worry that if it remains unchecked, North Korea’s nuclear program will metastasize and place South Korea at greater risk, despite U.S. assurances. “Korea and the United States need to come together as leaders and find alternative ways to force North Korea to give up its parallel pursuit of its nuclear program and economic development [the byungjin policy]. We need to find ways to force North Korea to honestly tell us what they really need.” The challenge, of course, is that persuasion has not worked with North Korea and North Koreans have continuously bristled at the idea that external pressure can work. In all probability, the North Korean leadership would consider an “honest” expression of needs to be a loss of face and tantamount to an unacceptable surrender to South Korea. The goal is clear, but there remains lack of effective instruments that will not bring about conflict. “Korea has superpowers as its neighbors. We have the ability and resolve to utilize our geopolitical setting as our strength.” This is a striking and refreshing statement from a Korean politician, given that the defining characteristic of Korea’s geography has been the curse of living in a bad neighborhood where regional rivals have historically used the Korean peninsula as the stage for military conflict. The most intriguing aspect of contemporary South Korean foreign policy thinking is the effort to leverage its geographic position as an advantage through the idea that Korea can be a middle power that relies on network power. This concept theoretically allows South Korea to move from being an outpost on the frontlines of conflict to the role of international node and connector. The challenge is that there are some clear prerequisites that must be addressed for South Korea to play such a role. First, there is a need for strong South Korean political leadership that is neither hobbled by internal domestic division nor excessive focus on North Korea. Both of these factors are inevitably perennial influences on South Korean foreign policy, but they must not be allowed to inhibit South Korea’s capabilities to play a regional leadership role. Second, South Korea’s power as a connector depends on it simultaneously maintaining productive relations with both Tokyo and Beijing. Without these two, South Korea risks being an outlier as the regional powers trudge forward without them. Third, while South Korea’s capability to play this role will continue to derive from its close alliance with the United States, its effectiveness will lie in South Korea’s ability to be a partner to the United States with sufficient strategic weight to offer both ideas leadership and connective capacity to achieve tangible regional outcomes. I imagine that most foreign observers may doubt whether South Korea’s political leadership can achieve even one of these prerequisites for it to exercise leadership in Northeast Asia. But if South Korea truly wants to transform its geography from a curse into a blessing, such a transformation will only occur through effective South Korean political leadership. If South Korea can achieve these goals, it wouldn’t be the first time that Miracle on the Han exceeded expectations. Scott A. Snyder is Senior Fellow for Korea Studies and Director of the Program on U.S.-Korea Policy. This post appears courtesy of CFR.org and Forbes Asia.